When you say "rock star" in your job post, you're discouraging the best software developers from contacting you. When you write, "We're looking for a rock star developer." A developer sees, "We want to treat a developer like the RIAA treats rock stars." Using "rock star" in your job post may have communicated a trendy vibe at one point, but those times have passed. Now it communicates a desperate attempt to seem cooler than you really are, a sign that you're too full of yourself, or that you're just naive. Naivety worries developers the most. To developers, "rock star" communicates that you're not sure what you want. Or rather, you do know what you want, and what you want is a miracle worker. "Rock star" signals that you haven't thought enough about the role this developer will fill, leaving developers with a feeling that they'll be receiving ill-defined requirements, not enough time, or not enough resources to do their job (in addition to being overworked and underpaid). Speaking of overworked and underpaid... there's really only one time "rock star" is appropriate: "We want a rock star developer. We know you're rare, and we'll pay you like a rock star." Sadly, this isn't usually the case. 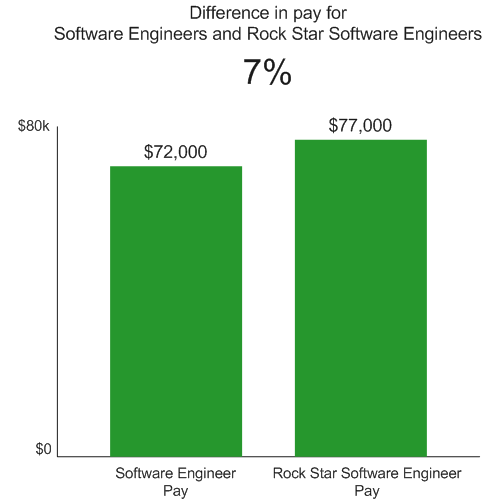 Here's how software engineers are paid in relation to rock star software engineers [1, 2]. 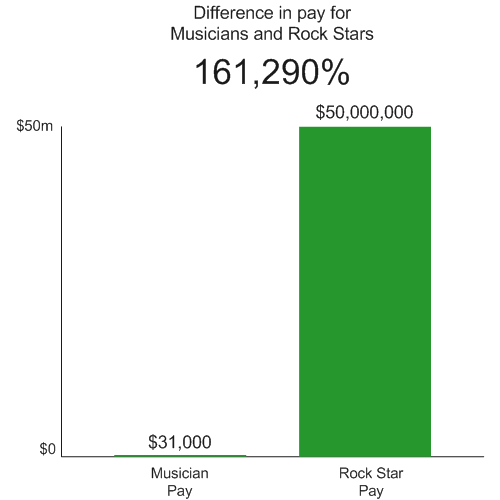 Now here's how musicians are paid in relation to real rock stars [3, 4]. Do you want a specialist or a generalist? If you want extraordinary people, can you compensate them extraordinarily or provide an extraordinary environment? Do you want a technical person who cares more about the business/market challenges or do you want someone who cares more about the technical challenges? Do you want someone who prefers quick, practical, "good enough" solutions or do you want someone who prefers to take their time and do things more maintainably or scalably? Do you want a feature developer or a maintainer? Do you want a risk taker? Let us know in the comments If you have any more high-level questions you like to have answered before you post a job description. Hirelite runs "speed interviewing" events over video chat to connect software engineers and companies hiring. If you're looking to evaluate the software job market or looking to hire, check out Hirelite.com. Average salary for the top 10 best paid music stars. But wait, those are only the top 10 musicians! Yes, exactly. Rockstars are stars because they're scarce, and because they're the best. Also, an associated queston on Hacker News a few months back was very helpful. Thanks for all the comments there today also.